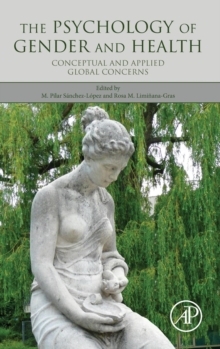 The Psychology of Gender and Health: Conceptual and Applied Global Concerns examines the psychological aspects of the intersection between gender and health and the ways in which they relate to the health of individuals and populations. It demonstrates how gender should be strategically considered in the most routine research tasks-from establishing priorities, constructing theory, designing methodologies, in data interpretation, and how to practically apply this information in clinical contexts. The topics covered in its chapters answer the needs of professionals, students, and faculty, providing an up-to-date conceptual tool that covers the relationships that exist between gender and health. The book will not only help users build expertise in psychology in gender and health, but also contribute to the awareness and training of psychologists as dynamic actors in the implementation of the gender perspective in their studies, reflections, research, and health interventions.